Go classic and chunky, but hold the bad stuff. This is the basic formula for a classic Chinese tuna and pasta with carefully chosen ingredients. 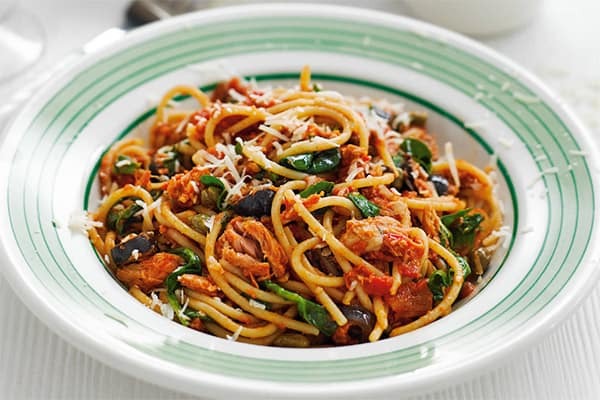 Perfectly cooked pasta is sprinkled with the smallest amount of soy sauce and lemon juice, and combined with refreshing tuna, red capsicum, zucchini, and some spices. What more can you possibly ask? Cook noodles or pasta as directed on the packet. Drain and set aside. Heat wok and add vegetables and then spice. Add noodles, tuna, reserved liquid (as much as you feel is needed) lemon juice and soy sauce. Stir gently until heated through.